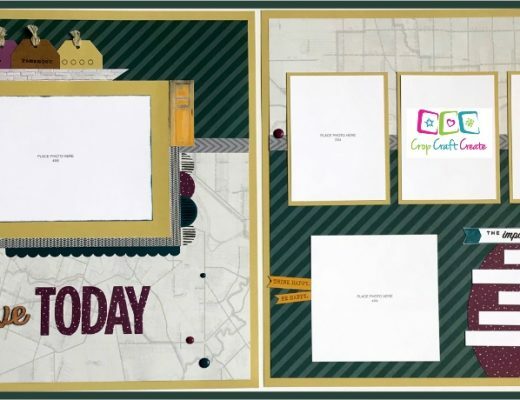 Learn how to re-create this Summer story scrapbooking layout in the comfort of your own home. 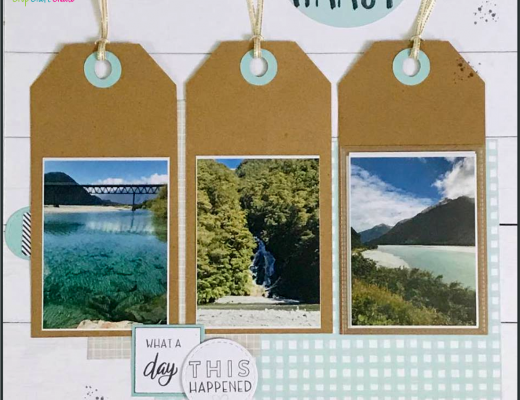 We are in the midst of a beautiful summer downunder, so I’m busy taking summer photos, and recording beautiful memories, beginning with this summer story scrapbooking layout. Of course, you don’t need to be in the midst of summer to have summer photos to record – I’m sure most of you would be able to say that you have at least one summers’ photos yet to scrapbook. Or one summers’ story to tell? Am I right?!! 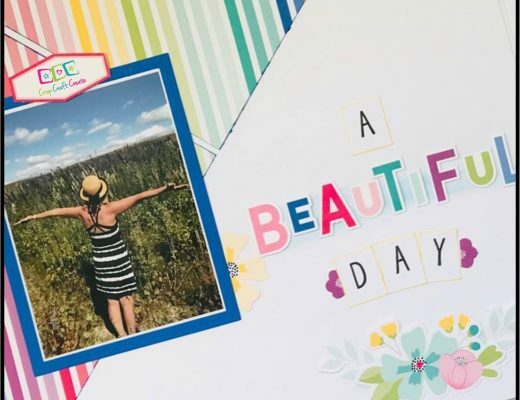 Here’s a really simple but stunning summer story scrapbooking layout. This is actually the ‘intro’ page to more detailed pages of all these summer events. You’ll see I’ve not finished the layout either – because it’s still summer, so I know I’m going to have some more great memories to put on this page. Let me share a few of the ideas used to create this layout. To start, I’ve added a bit of ‘texture’ to the background, by splatting a bit of ‘lagoon’ shimmer pen. To create the pen, I added drops of ‘lagoon’ ink into a clear shimmer brush, gave it a good shake, and hey presto, now I have a lagoon shimmer brush. If you do this, you permanently change your brush to the colour used. But, as lagoon is my all time favourite colour, I was quite happy to commit this brush. To actually create the splats, I simply put my pen over the places on my page where I want some colour, and firmly tap near the end of my brush. 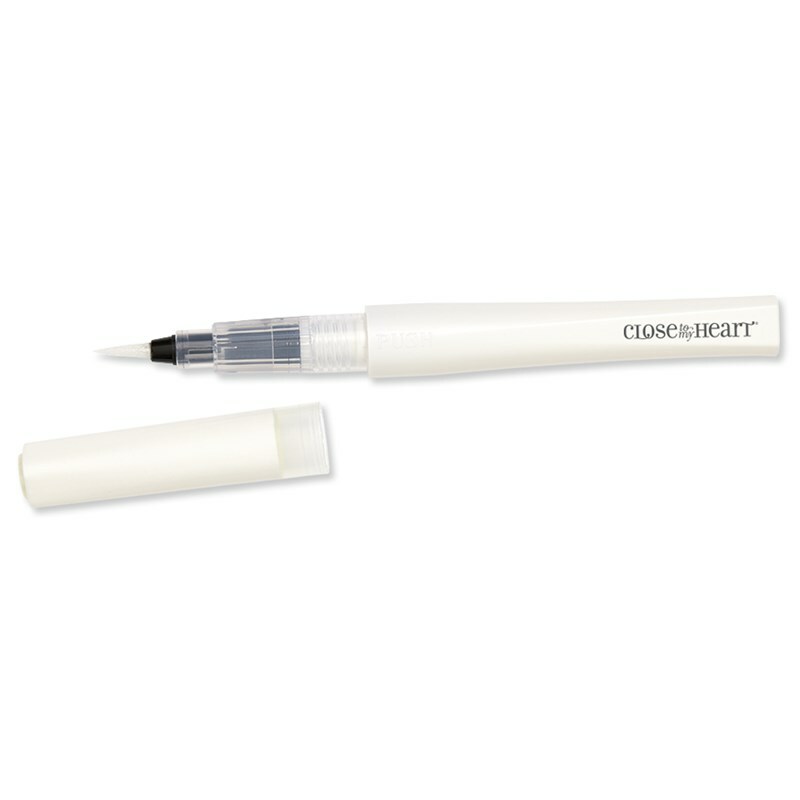 This disperses some ink at random on your page. 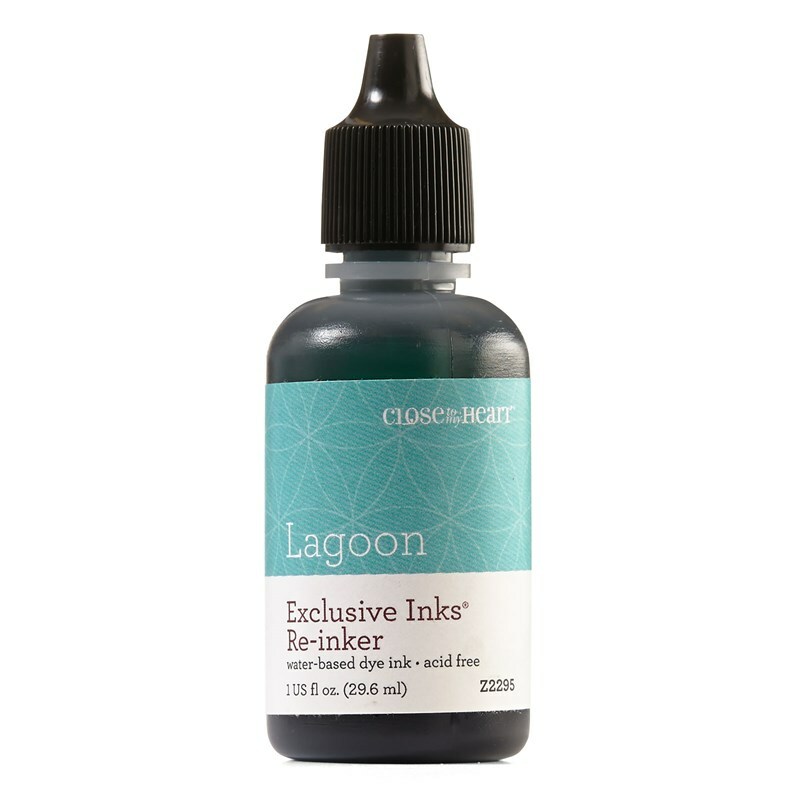 If you were able to see this in person, you’d see I have some lovely random lagoon ink spots, that also shimmer beautifully. It’s a subtle but beautiful enhancement to the layout, and just takes away some of the ‘whiteness’ of the background. You’ll see on the close up image above, that some of the papers are embossed. I used the ‘Playful Scallops’ folder, as to me it portrayed waves / water, which is what summers in New Zealand usually involve a lot of! To use an embossing folder, you need an embossing machine, like the Cuttlebug or Big Shot. The Summer title and the gorgeous sunshine were cut on my Cricut machine. (For those who don’t know this is an electronic cutter.) The sun comes from CTMH’s Flower Market cartridge, whilst the Summer title (#M37741) is a freebie from the Cricut Font and Basic Shapes. After completing the layout, I then added a few of the I Heart Us sequins, firstly because they’re designed to co-ordinate with the paper, secondly because they’re SO pretty, and thirdly because you always need to finish with a little bling! The stamps used for ‘story’ and ‘the details’ are from ‘I Heart Us – Scrapbooking‘ stamp set D1826. As you can see, it’s some great sayings on it for scrapbooking. That writing font is an absolute favourite – oh how I wish I could write like that. To get just the ‘story’ I just inked that part of the stamp (or you could mask the rest of it). I also stamped all the ‘numbers’, using the Simply Said alphabet set (C1725). This is another great stamp for scrapbookers – it’s a simple font that will go with most things. The decorative papers used come from two different paper packs; Mix-in and I Heart Us. Aren’t they just the most beautiful, cheery papers?! 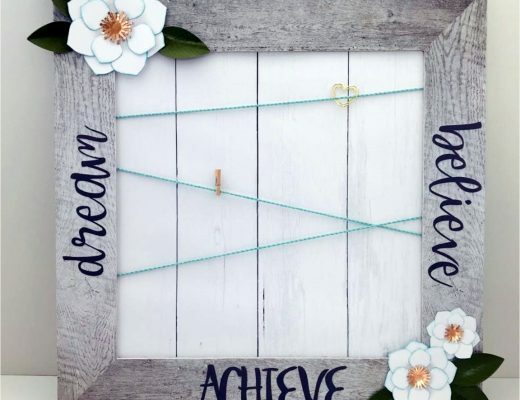 So – want to create this Summer Story scrapbooking layout at home? 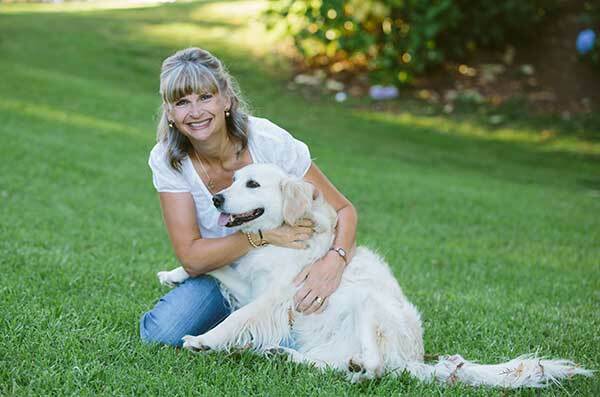 Sign up for my email list and you’ll receive the instructions for free. Join for hints, tips, and inspiration.